A Plea by Mark Twain for the Setting Apart of His Birthplace. There is a natural human instinct that is gratified by the sight of anything hallowed by association with a great man or with great deeds. So many people make pilgrimages to the town whose streets were once trodden by Shakespeare, and Hartford guarded her Charter Oak for centuries because it had once had a hole in it that helped to save the liberties of a Colony. But in most cases the connection between the great man or the great event and the relic we revere is accidental. Shakespeare might have lived in any other town as well as in Stratford, and Connecticut's charter might have been hidden in a woodchuck hole as well as in the Charter Oak. But it was no accident that planted Lincoln on a Kentucky farm, half way between the lakes and the Gulf. The association there had substance in it. Lincoln belonged just where he was put. If the Union was to be saved, it had to be a man of such an origin that should save it. No wintry New England Brahmin could have done it, or any torrid cotton planter, regarding the distant Yankee as a species of obnoxious foreigner. It needed a man of the border, where civil war meant the grapple of brother and brother and disunion a raw and gaping wound. It needed one who knew slavery not from books only, but as a living thing, knew the good that was mixed with its evil, and knew the evil not merely as it affected the negroes, but in its hardly less baneful influence upon the poor whites. It needed one who knew how human all the parties to the quarrel were, how much alike they were at bottom, who saw them all reflected in himself, and felt their dissensions like the tearing apart of his own soul. When the war came Georgia sent an army in gray and Massachusetts an army in blue, but Kentucky raised armies for both sides. And this man, sprung from Southern poor whites, born on a Kentucky farm and transplanted to an Illinois village, this man, in whose heart knowledge and charity had left no room for malice, was marked by Providence as the one to "bind up the Nation's wounds." His birthplace is worth saving. The above article by the author and humorist refers to the movement on foot to make of the Lincoln Birthplace Farm a National park of patriotism. The farm consists of 110 acres in the rolling blue grass region of Larue County, Ky. It is crossed by a picturesque stream, has many shady groves, and possesses the famous rock spring near which it is proposed that the Lincoln statue shall be erected. But a short distance away, along the turnpike, stands the old mill where Lincoln used to go with his father, the boy seated astride a rack of corn on the broad back of the old mare. Instead of appealing to the wealthy few to carry out the work, the association has given its cause to the whole people, asking "every man, woman, and child in whose heart is the love of country and a reverence for the memory of Lincoln" to become a member. Each member is called upon to contribute whatever amount he or she wishes, provided it is not less than 25 cents or more than $25. 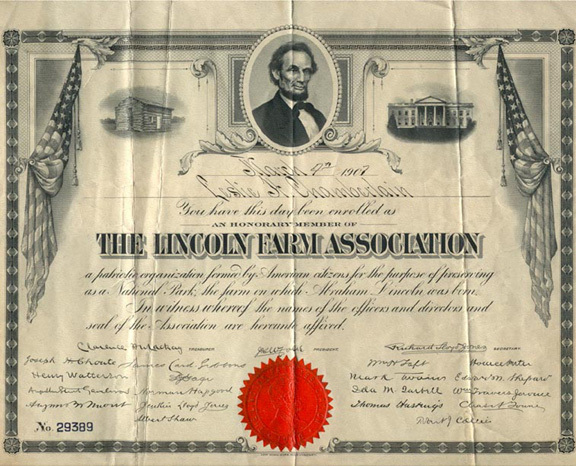 The officers and Board of Trustees of the Lincoln Farm Association, which has its offices at 74 Broadway, New York City, include Joseph W. Folk, President; Joseph H. Choate, ex-Ambassador to England; Henry Watterson, Cardinal Gibbons, Edward M. Shepard, August Belmont, Horace Porter, William Travers Jerome.